For beginners and professionals and everyone in between, archery is a fun sport that builds arm strength and hand-eye-coordination. Bows can get expensive but if you are new to archery and just starting out, you would probably prefer to start with a cheaper model. This list has some of the best recurve bows under $100 to make your introduction to archery and buying a recurve bow as smooth as possible without emptying your wallet too much!. Three of the best recurve bows under 100 dollars, are the PSE Razorback, the KESHES Takedown and the SinoArt Falcon. We'll review each one in more detail below! This bow weighs only 2.2 pounds and comes in 62 inches. Archers have three draw weights to choose from: 20 pounds, 25 pounds and 30 pounds. This is also a takedown bow, which means it can be disassembled into three pieces (the riser and limbs) and transported easily. The bow arrives disassembled and the user must follow the instructions to put it together, which isn't too difficult. Attaching the limbs to the riser is easy because the screws do not require any tools; they can be hand-cranked and the bow is ready to go. However beginners should look into buying a bow stringer instead of doing it manually. Bow stringers not only will keep an archer safe while assembling the bow but it will string the bow correctly and reduce the risk of accidents involving the string. Stringers do not come with this bow and have to be purchased separately. The good news is that PSE guarantees a limited lifetime warranty in case something is wrong with the bow or it breaks. One condition of their warranty is that the customer must replace the string at least once a year or the warranty is voided. But strings should be replaced often anyway to avoid accident and injury. This particular bow takes a string that is 50 inches actual size. Because the maximum draw weight for this bow is only 30 pounds, it is not powerful enough for hunting, even for small animals like squirrels and quail. This bow is intended solely for beginner target practice but it is equipped to fulfill its purpose beautifully. The bow is equipped with holes where accessories can easily be attached. Customers can use sights, quivers, stabilizers and other items to add to their archery experience, though the accessories do not come with the bow and must be bought separately. Most archery experts recommend starting without sights and accessories anyway just to get the feel for shooting a bow. This bow has a very comfortable grip and is sized right for smaller hands like those of kids and most women. It is made of hardwood and wood laminate which makes it last a good long time, even if it is used often. 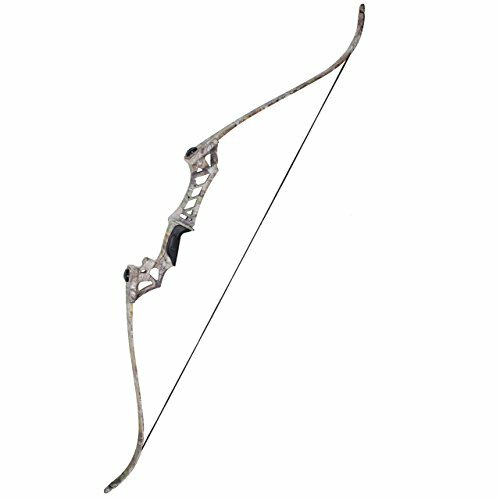 Overall, this is a great quality beginner's bow with top-notch features. 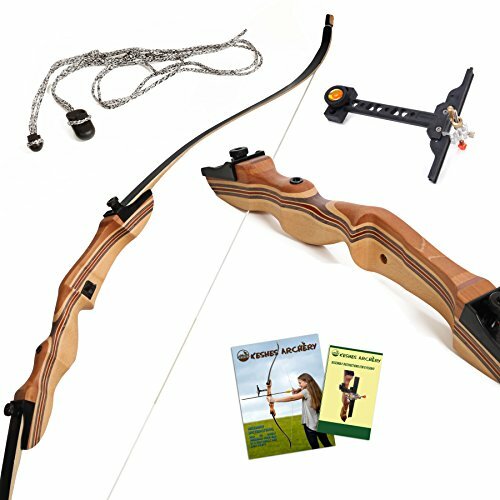 Low price bow that is excellent for beginners, including women, kids and teens. WThis 62 inch bow is so special because it can be used by either right-handed or left-handed archers. It comes in very light draw weights, starting at 15 pounds and going all the way up to 35 pounds. What is great about this versatile bow is that the limbs can be adjusted to different draw weights; the same bow could potentially be used by different members of the family. Much like the Razorback, it arrives disassembled in 3 pieces and is put together by the customer. One drawback of this model is that the instructions are sometimes confusing and customers have to fiddle with the parts a while to successfully get them put together. Don't let this be intimidating though as there are a lot of online guides that can help. This bow comes with a stringer tool so the customer can safely string the bow without having to buy a separate piece. It also comes with sights that can be attached to the bow for those looking for higher accuracy. Another included accessory is an arrow rest that is easily attached to the bow. This is great for beginners because sometimes they need help adjusting their grip or draw and resting the arrow helps them do that more comfortably. This bow is not powerful enough for hunting game but is still an amazing bow for beginner target practice, especially with its inclusion of valuable accessories and wide versatility of usage. This bow is 60 inches and weighs only 2.75 pounds for easy traveling. It comes disassembled and the customer must put it together themselves. This model comes in a wider range of draw weights than the others; it is available in 30, 35, 40, 45, 50, 55, 60, 65 and 70 pounds. Because the draw weight can be significantly higher than other beginner bows, it is powerful enough for hunting small and big game, though big game might take two arrows instead of one. Unfortunately at this time, SinoArt only makes the Falcon for right-handed archers. However this is still a great beginner bow due to its versatility and durability. Its riser is made of metal and the limbs are made of aluminum-magnesium alloy coated in slabs of hardwood. This makes the bow slightly heavier than other models, but very long-lasting and strong. It comes with an arrow rest but other accessories and stringer tools must be purchased separately. Since this bow comes in such a wide range of draw weights, consider the person who is going to be shooting it. For beginners, get a lighter weight in the 30 to 35 pound range and more experienced archers can go up from there. But as far as beginner bows go, this one is one of the most durable out there. All three bows reviewed here are popular, high quality recurve bows that can be found on Amazon for less than $100! Each one would be a solid choice if you're looking to starting getting into archery and mainly want to develop your skill and accuracy shooting targets at the practice range. If you're still unsure which bow is best, we would recommend the KESHES Takedown Recurve Bow. Most people who have bought it have been very impressed with the overall quality construction of the bow and especially the wooden riser! This would be a great choice if you're looking for your first bow and don't want to spend more than $100! If you didn't like any of the recurve bows we reviewed here, why don't check out our detailed list of the 5 best recurve bows!